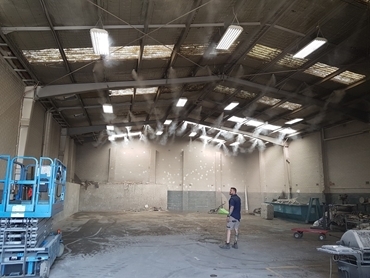 A Sydney-based skip bin operator involved in construction waste disposal employed a dust suppression solution from Tecpro Australia to resolve their dust problem. The booming construction industry across Australia has led to a thriving business in construction waste disposal. However, skip bin and waste transfer operators involved in this work, especially those businesses dealing with gyprock and plaster disposal, are faced with the problem of dust exposure from construction materials, which can affect the health of workers and neighbours. Dust can also decrease visibility and lead to faster wear and tear on equipment. This skip bin operator located in southern Sydney sought an effective dust suppression system that could be installed and made operational quickly as they worked six days a week. Tecpro Australia’s engineering team, which has a long history of designing and supplying dust suppression solutions across a wide range of industries, was able to design, supply and install a turnkey dust suppression system for the skip bin hire company. The system was installed on a Sunday and ready for operation on Monday morning when work resumed at the site. Tecpro recommends their ceiling mounted fogging system for waste transfer stations and recycling stations operating in an enclosed environment. These fogging systems use high water pressure to produce extremely fine droplets to drag the dust down. The ultrafine mist generated by the system prevents wetting and pooling on the ground. Designed for water efficiency, the fogging system uses less than two litres per minute while providing effective coverage. In the Sydney installation, the system was easily retrofitted into the existing site. Tecpro Australia has been supplying thousands of dust suppression solutions for a variety of industries for about 35 years. For more information, please visit the Tecpro Australia website www.tecpro.com.au or call 02 9634 3370 to speak to a specialist consultant.